The late Father Mark Schmieder would have celebrated his 70th birthday this past August 3. Since Father Mark was conducting important business elsewhere, the party occurred at the House on that date. Our Master Chef, Ted Lewis, created an excellent dinner for the celebration. About thirty folks — House guests, staff, board members and volunteers — participated in the nostalgic repast. Sister Kay led the meal prayer and the Father Mark stories abounded, provoking both laughter and melancholy. We do so much miss him. Father Mark’s brother Carl Schmieder was the special party guest, sharing amusing tales and fond memories. We had such a good time that we decided to make August 3rd an annual House event in Father Mark’s memory. Ted is planning the menu and we will see you at the House August 3, 2011. The first purpose of the St. Francis-St. Joseph Catholic Worker House is to help homeless men transit into the mainstream of society. Through the third quarter of 2010, 58 men have gone to work and independent living. This represents a succcess ratio of 35% of our net intake. Over 200 men were provided at least a bed and a meal, as well as a chance at success. These numbers are consistent with our history and vary little from the past few years. The difficult economy means that we give the guests more time to find work and adjust. Small impediments can become large obstacles. Many jobs require steel toed boots, which the fellows cannot afford. Thus we are instituting a program to provide vouchers for a pair of boots when needed. Each pair costs $35 and we are requesting our supporters to consider a $35 donation specifically to provide a voucher. Staff turnover remains very low with one employee departing this year. We have hired David Elliott who has performed admirably in his new role. I welcome visits to the House for those interested in volunteering or donating. Please contact me at sfsjhouse@fuse.net or 382-5100 to make an appointment. Thanks for your kind support in our efforts to help the men help themselves and provide needed services to the Over-the-Rhine community. Can you help a homeless man onto his feet? SFSJ House management has instituted a program to provide vouchers to Catholic Workers for steel toe boots, often required for employment. in the memo section of your check. Thank you! Those involved in the SFSJ mission have emphatically eulogized Father Mark for his compassion, courage and commitment. Father Mark has surprised us once again with his generosity, leaving the SFSJ House a substantial financial legacy. The Board of Trustees, desiring to preserve the monies and honor Father Mark, established an endowment fund in Father’s name that will generate $15,000-$25000 annually for House operations. The legacy heightens the importance and urgency of continuing Father Mark’s work helping the homeless and disenfranchised. Thank you to Father Mark and the entire Schmieder family. The Board is pleased to report that the House is well managed, duties are allocated and finances are in order. We recognize that the continuing effectiveness of House operations and services are due in large part to our Manager, Karl Fields. Despite undergoing chemotherapy treatments, Karl binds together the sometimes chaotic machinations of staff, volunteers and guests. The Board thanks him for his efforts and prays for his health. We also acknowledge and thank Carl Schmieder for his volunteer efforts and advisory role to the Board. Also, the Board heartily thanks Jack and Marie Eiting and Katherine Eiting for their sustaining support of the House. Welcome to our newest Trustee, Mary Repaske, a long time friend of the House and professor at Cincinnati State. The Board welcomes ideas, suggestions, queries and criticism from our loyal supporters. Please contact trustee Michael (651-8482 or 731-2092) with any comments. Thanks for your support of the House. My name is Anthony Morgan. With the help of the great people of the Catholic Worker House and the people that donate, I graduated here a new man. I’m clean, sober and back on the right track, being a successful young man again. This house and staff members mean more to me than I can put into words. They have actually been through the hard times, so they know what guys like me are going through and can counsel us accordingly. Because of them guiding me, I have my own place now with stability. My family loves me being around again. I know I owe these staff members and the kind donors everything and I couldn’t have asked for better friends. Thank you all from the bottom of my heart for teaching me, guiding me back to where I should have been, and giving me the mind medicine that no doctor can give. This House is the best thing that ever happened to me and I’m so grateful for these good people. It’s like they were sent from heaven for me. 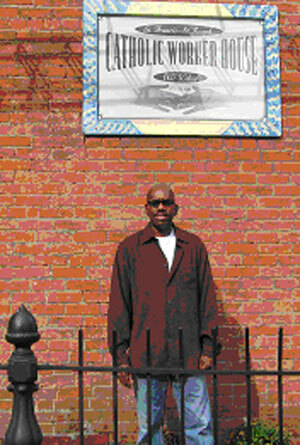 Unlike many on the SFSJ staff, Danny Jackson was never homeless nor was he afflicted with alcohol or addiction problems. However, when Danny became ill in 2004 and fell behind in child support payments, he was sentenced to 500 hours of community service. As a full time City of Cincinnati worker, Danny squeezed the required hours into a long succession of weekends, toiling at the SFSJ House. He worked soup kitchen, interacted with the staff and guests and, at some point, realized the goodness and importance of his work at the House. Shortly after Danny completed his service requirement, an opening occurred for a weekend 1st shift SFSJ staffer and Danny was hired. Manager Karl Fields states that Danny’s effectiveness with the guests arises from his laid back style and being a good listener. Another secret to his rapport with the guests happens each Sunday morning when Danny cooks his world famous fried potatoes, cheesy eggs and sausages. Sadly, Danny lost his mother this past summer so please include the Jackson family in your prayers. If you happen to come by the House during the weekend please say ‘Hi’ to Danny. Please join the fun on Saturday, December 18 at 6-10 pm for the annual Catholic Worker House Christmas Party. This has evolved into quite the jolly event with House guests, staff, trustees, volunteers and donors assembling for a holiday feast, singing carols and just enjoying yuletide fellowship. While the singing may not sound divine, we are certain the chords reach their heavenly destination. The guest gifts are definitely a highlight of the festivities. If you wish to bring a gift of clothing or toiletries, the guests will much appreciate your kindness. We hope to see you at the House on December 18th! 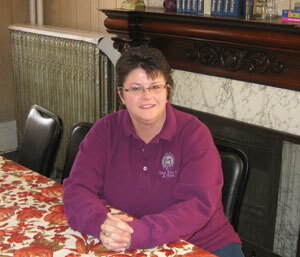 I’m Ida Mueller, a woman who loves the mission and experience of the St. Francis St. Joseph Catholic Worker House. On a Tuesday evening in September, 2006, I first came to the House to give “my lead”, my statement of faith in the Alcoholics Anonymous program. That meeting was my first for an all men’s shelter. Since then, I have been coming on a regular basis to the weekly Tuesday meeting. I found out that the House is a wonderful place for recovery, and that I fit in with it and all who are in recovery. Sometimes the men refer to me as a sister, mother, aunt, or just a friend. I try to learn the men’s names to better communicate and to acknowledge each with dignity. I realize that it’s hard to be homeless: your self-esteem is low and you have to start over again. Sometimes a smile works just as well. I saw a man named William at Tucker’s on Vine, in the beginning of September, 2009. He was a guest at the St. Francis St. Joseph Catholic Worker House, when I first started to come to the AA meetings. Our eyes met and William came over and said “Ida, I’m about 3 years sober and you had a big part in it.” William hugged me and left Tucker’s. I was so overwhelmed with joy that my eyes filled up with tears and I was speechless. You never know whom you might touch. Please visit our website for articles regarding the Catholic Worker Movement and history of the St. Francis-St. Joseph Catholic Worker House. On the home page, you can access a clip of a recent Channel 19 feature about the House and its mission. The story is rendered with realism and compassion. You can email the House Manager or any Trustee by clicking on his or her name in the “Who We Are” section of the site. We convey a special thank you to Linda Wolf and Steve Kiernan for donating considerable time and special expertise to develop and maintain the website. Sister Kay Tardiff descended upon the House as an angel. Last fall, Father Mark was very ill and we were experiencing a spiritual and pastoral void. Sister Kay stepped in as Board Trustee and Spiritual Director for the Catholic Worker House. Since Father Mark died, she has filled the pastoral role for the House in both prayer and counseling. Sister Kay works closely with House Manager, Karl Fields. Sometimes they collude on mundane tasks such as obtaining supplies or conducting staff meetings. But Sister Kay is most effective when counseling the guests one on one. Despite seeming to have little in common with these somewhat hardened men, Sister Kay’s compassion and understanding breaks through barriers of dishonesty and delusion. For the Board of Trustees, Sister Kay provides a strong conscience and spirituality to the decision-making process. We hope that you can meet her and that she continues her mission with the House. Recently, Sister Kay experienced painful back surgery and her presence has been missed. Please pray for her recovery and that she has returned by the time this is published. Aside from our excellent staff, the most important SFSJ asset is the House itself. In 2010, new electrical plugs have been installed throughout, enhancing both safety and convenience. In addition, new cellar doors have helped staff and volunteers access the basement with ease and safety. Dedicated supporters Jack and Marie Eiting of Oregon visited the House this summer. Mrs. Eiting recognized the aging refrigerator as our most important appliance, considering the gastronomical requirements of sixteen men. 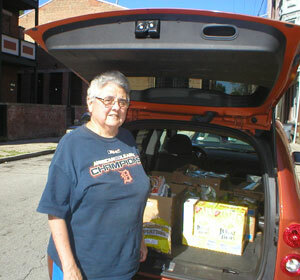 She subsequently donated a brand new refrigerator of size and quality to meet our substantial kitchen needs. Thanks much to the Eitings. The Board has committed to more aggressively pursue institutional grants for facilities upgrades and fixes. Currently, we are in the process of applying for a Greater Cincinnati Foundation grant for roof repairs. Going forward, we will be continuously seeking such foundation funds for work on the old House. Thanks to all who have helped with their time and money. Board Trustee volunteers Kevin Staigl and Bob Bertsch work with Manager Karl Fields on facilities management. 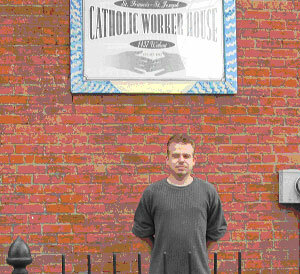 The St. Francis-St. Joseph Catholic Worker House vigilantly protects its independence and freedom from politics or distracting influences in order to focus on the mission of helping the homeless and poor. The House receives no government or diocesan funding and operates with simplicity and frugality.